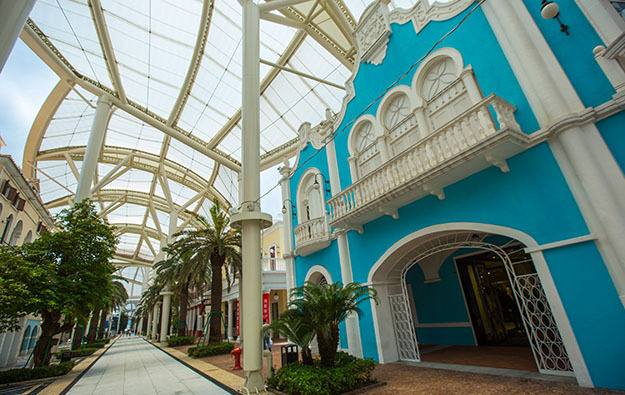 Several restaurants and shops at Macau Fisherman’s Wharf are accepting cashless payments made via Chinese mobile payment platform Alipay and stored-value card Macau Pass as well as the latter’s e-wallet application MacauPay. Macau Fisherman’s Wharf (pictured) is a waterside facility on the city’s peninsula featuring a standalone casino, a casino hotel, several hotels without gaming, and other amenities. The Alipay deal will not cover casino or other gaming transactions. “Under this partnership with Alipay and Macau Pass, the respective mobile payments made via these two platforms are accepted at many of the restaurants at the property [Fisherman’s Wharf], as well as at the checkout facilities of our hotels,” Melinda Chan Mei Yi, president of Macau Fisherman’s Wharf, explained to GGRAsia, noting that the mobile payments will be accepted at the site’s Legend Palace Hotel, the Harbourview Hotel and The Rocks hotel. She added the service was targeting mainland Chinese visitors in particular. Macau Fisherman’s Wharf International Investment Ltd, an entity related to Hong Kong-listed casino services firm Macau Legend Development Ltd, signed on Wednesday – with representatives from Alipay Hong Kong Ltd and Macau Pass SA – the cooperation agreement. Ms Chan was a Macau legislator up to October this year, and is the spouse of David Chow Kam Fai, co-chairman and chief executive of Macau Legend. The Macau government announced in November 2015 that Alipay would be legal for use in Macau for in-person transactions for non-gaming services. Macau casino operator Galaxy Entertainment Group Ltd says mainland Chinese visitors to its Galaxy Macau and Broadway Macau properties in the city’s Cotai district can make contactless mobile payments via smartphone – using an Alipay app – at restaurants, for hotel and resort services, and when shopping, at 100 separate locations. In May 2016, Singapore casino complex Resorts World Sentosa said that Alipay was its preferred partner for contactless mobile payments made on site for non-gaming items purchased by visitors from mainland China. Macau Legend Development is the promoter of Macau Fisherman’s Wharf, a site located near the Outer Harbour Ferry Terminal in Macau peninsula that launched to the public in 2006. Early on in its development, the site opened the non-gaming hotel Rocks Hotel, and a casino without hotel called Babylon Casino. Since then, the open-air site has undergone extensive remodelling, including a canopy for part of its main avenue. Macau Legend Development has so far completed two out of three new hotels planned for a revamp of the site: the Harbourview Hotel, which opened in February 2015 and does not have a casino, and the casino hotel Legend Palace, which opened in February this year. Ms Chan was quoted by local Chinese-language media published on Thursday that Macau Fisherman’s Wharf was looking to introduce more “tourism elements” to enhance the site’s appeal next year. Further details would be announced later, she told us.